Jamming since 1996 when 3 of members met each other at Berklee College of Music in Boston, and signed to Japan's finest record label "Jazzy Sport Production" after they returned back to Tokyo. Based on soul music, Cro-Magnon sound is fusion of house, dub, jazz, funk, reggae with essence of many other good music. In past years, they worked with many International and Japan's domestic talents such as "Roy Ayers" "Idjut Boys" "Sa-Ra Creative Partners" "Steve Spacek" "Asako Toki" "Yohei Miyake" to name some. All of their releases keep having respectable feedback from many music lovers in oversea. Also you may find their amazing quality cover tunes of "Moodymann" "Herbie Hancock" "Freddie Hubbard" "Stevie Wonder" "Michael Jackson" "Jackson5" "Sly and Family Stone" "Sade" on their stage. Groove of Cro-Magnon is absolutely another level and far beyond "music genre". 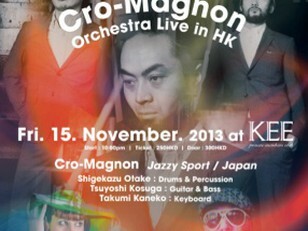 Cro-Magnon has already rocked many cities in Asia and Europe and got solid reputation for their unique live performance as one of the the best dance live music from Japan. In this year, they performed at Fuji Rock Festival and just finished their 3rd Europe tour to perform in 10countries with huge praise and success. And for this session, they form "Cro-Magnon Orchestra" with HK based vocalist "Genevieve Marentette" and trumpeter "Danny DePoe" as special collaboration. it's gonna be freakin' deep and soulful as original Detroit sound. Alongside, Jazzy Sport label owner "Masaya Fantasista" and HK based Japanese DJ "Taku Hirayama" will be on decks with vinyls. Don't miss this world quality session!!!!!!! !